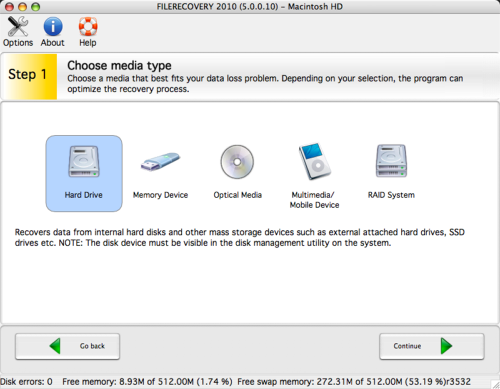 FILERECOVERY 2012 Professional for Mac runs natively under the Mac OSX file systems 10.4 and higher, and recovers lost data and volumes from HFS/HFS+, HFS+, HFSX , HFS Wrapper, all FAT and NTFS file systems. Easy to use wizard allows novice users to recover data. Recover your files, photos, music and videos from almost any kind of data loss. Recovers data from damaged, deleted, or corrupt volumes, even from initialized disks.